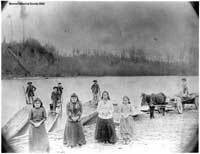 In the beginning of the white era in Snohomish County the river was the only highway. All the functions now fulfilled by railway and public road were then the exclusive province of the river. For this reason it was of prime importance to the pioneer. Its course defined the path and the limits of settlement, for the dense forest, inaccessible by water, was worthless no matter how fine the timber nor how rich the soil. It was the river which must bear the pioneer’s wares to market, whether those wares were logs or the products of the farm. It was the river which must bring him his supplies. It was the river which gave him his slight touch with the outside world. It was the river which brought him all that he knew of friends and neighbors and social life of any kind. More than one western Washington settlement suffered deprivation almost amounting to famine, when for any reason the river was obstructed. Under these circumstances every phase of the river was watched with absorbing interest. Whether the water was low or high made a vast difference; almost the difference that it would mean today as to whether all the roads and all the railways were blocked or open to travel. The first craft to ply the river was, of course, the Indian canoe. Utmost care was used in the selection of the logs from which these canoes were made that no blemish of the wood should mar the perfect craft which was the Indian’s pride. Towed to a convenient place, the log was stripped of bark and then, with axes of stone the top was split off or levelled to make ready for the burning. Stones were heated and placed upon the flat surface and the burning process was begun. This required many days and infinite care and skill. Should the log be burned too near the edge the whole structure would be weakened or entirely spoiled. After the burning came the most expert work of the canoe builder. Both the inner and the outer lines of the canoe must be made smooth and perfect. Stone chisels and stone adzes were used for the first of this work, and this was followed by scorching, and scraping with sand stone. The great war canoes were sometimes nearly seventy feet long…. The canoe of commerce, the one used by the men of the tribe for hunting and fishing and ordinary journeyings, were much less ornate and were usually no more than twenty feet in length. They were handled with great skill and braved rough seas. [Such a canoe is on display at the Monroe Historical Museum.] Still smaller canoes were used by the [women] of the tribe. Many of these craft were not more than ten or twelve feet long and were of rougher finish but possessed of pointed prow and graceful lines. Nevertheless, these were the canoes most used both by the Indians and by the early white settlers. There is evidence that these canoes reached the very headwaters of the rivers. These Indian “gondoliers” were cheaply hired and their muscles and their canoes furnished the first transportation in the county. Although The Traveler became the first steamer up the Snohomish River in 1855, going some eight miles, it was another decade before there were any commercial vessels running the Snohomish River. By the late 1870s, river steamers were also traveling up the Snoqualmie River as far as Falls City and up the lower Skykomish as far as Park Place and the site of Pattison’s Ferry. In May 1887, The Gleaner became the first steamer to travel some distance up the Skykomish stopping less than two miles below Sultan. The following January, The Mame reached Sultan and continued upriver another three miles. With the mining boom of 1891, river traffic to Sultan became a regular feature with daily roundtrips between Snohomish and Sultan on the The Monte Cristo and three times a week on theThe Minnie M. The runs were short-lived ending by August 1892 with the coming of Great Northern Railway. –from the History of Snohomish County, Washington, edited by W. M. Whitfield, 1926.